International friendlies are very rarely the most eagerly awaited type of match in the football calendar. The friendly between two of the world’s true heavy weights with two-time World Cup winners Argentina taking on four-times winners Italy in Manchester last Friday proved different however. Argentina are one of the favourites heading into the summer’s tournament while Italy famously failed to qualify for the first time in 60 years. What this game proved was that both sides are really good, which is welcome news ahead of a future under a new coach for Italy while Argentina hope to put their regret on losing the 2014 final into motivation for a third World Cup trophy. It was a great friendly played at a high tempo and some quality football being displayed. There were also a few interesting tactical take-aways from the clash. Argentina just barely managed to qualify for the tournament in Russia in their last round of fixtures but now there Jorge Sampaoli’s men are tipped to be one of the favourites. It’s easy to understand why. Sampaoli lined up his team in a very fluid and flexible formation which was a nominal 4-2-3-1 but changed throughout the game’s different phases. Willy Caballero was in goal and the back-four consisted of the young Fabricio Bustos at right-back, Nicolas Otamendi and Federico Fazio at centre-back with Nicolas Tagliafico at left-back. Tagliafico was very impressive and someone the masses will definitely get to know in the summer (if you want more on him, we profiled him a few months back). Lucas Biglia anchored the midfield alongside Leandro Paredes with Giovani Lo Celso starting in a more attacking position in the midfield three. Manuel Lanzini started on the right of attack with Angel Di Maria on the left and Gonzalo Higuain acting as the central striker. Italy are yet to appoint a new coach which saw caretaker Luigi Di Biagio in charge for this friendly and the clash against England. Di Biagio continued on his trend from the U21’s by using a 4-3-3 formation with Gianluigi Buffon in goal behind the quartet of Alessandro Florenzi, Leonardo Bonucci, Daniele Rugani and Mattia Di Sciglio in defence. Jorginho acted as the deep-lying midfielder with Marco Parolo to his right and Marco Verratti to his left. Up front was the Serie A top scorer Ciro Immobile flanked by Federico Chiesa on the right and Lorenzo Insigne on the left. What was clear from the first whistle was the fact both sides wanted to press their opponent. Italy did this in a more positionally-orientated way which did on occasion include some loose man-orientations especially against Biglia when Argentina started from deep. Argentina was largely man-orientated and even more aggressive than the Italians. If we look at Italy first, they often had Immobile starting pressure on the right-sided centre-back Otamendi while Parolo would push up against Fazio when the ball was being played across. This created a situational front two and saw Italy press in a 4-4-2. If the remaining two central midfielders had access to Biglia and anticipated an opportunity for Argentina to find the Milan playmaker then Jorginho would push up high and mark him. This would leave Verratti centrally in a numerical disadvantage against Paredes and Lo Celso, but fortunately for Italy this rarely happened. In the example below, Immobile has started pressure against Otamendi who has played the ball back to Caballero. Immobile has continued his pressing action and uses his cover shadow to stop the pass back to Otamendi. We can clearly see the high positioning of Parolo and Jorginho against Fazio and Biglia in particular. If Argentina moved the ball wide to their full-backs down the flanks in their own half, Italy would aggressively move across and commit players to the press to cut off passing lanes for the player in possession. The image below illustrates this approach as Argentina are locked in down the side with six Italian players in close proximity to the ball to provide pressure and stop an easy out-pass. Even the centre-back Rugani is very high up the pitch to participate. It should be noted that should this press fail, Italy leave a lot of space centrally (especially in the image below due to Parolo’s high positioning) for Argentina to progress through. Thankfully though, the defensive overload was very effective and despite the Argentinians dominance of possession in the first half, they didn’t create any big chances. As stated, Argentina’s pressing was even more aggressive and they went man for man high up the pitch to disrupt Italy’s attempts of building attacks from the back. As you see below, Di Maria would often leave his flank to come inside to press Bonucci while Higuain waited for the pass to be played to Rugani which is when he would press the centre-back. The below image is a continuation of the same play started above and sees Rugani play a pass into midfield to Verratti. The Argentina midfield three of Biglia, Paredes and Lo Celso is highlighted with black circles and it’s clear to see their man-orientations against the Italy midfielders. Di Maria and Higuain still has access to Bonucci and Rugani which removes them as options for Verratti to bounce the ball off to while Lanzini on Argentina’s right flank is marking Italy’s left-back De Sciglio. This aggressive marking proved difficult to handle for Italy who struggled to keep possession for prolonged spells in the first half, although Argentina’s press was sometimes broken by the technical brilliance of Jorginho or Verratti which then opened up huge space behind Argentina’s midfield. Here, I’ve drawn a line through the middle of the pitch to highlight the way Argentina, just like Italy, overloaded aggressively in wide areas to try and win back possession high up the pitch. Italy have rotated here with Verratti (white) on the ball in the left-back position and De Sciglio (yellow and marked) higher up while Insigne has come inside. The right-back Bustos has followed Insigne inside though to keep marking him closely while Di Maria has moved all the way across to mark Jorginho in the centre. Paredes picks up Parolo, Higuain blocks Bonucci, Lo Celso has gone wide to mark De Sciglio while Lanzini helps Biglia in pressing Verratti. That makes it seven players actively taking part in this pressing action down Italy’s left flank. One reason to why Argentina managed to dominate possession in the first half was their sublime counter-pressing once possession was lost. Immediately when an Italian picked up possession there would be two or three Argentinians aggressively pressing him to block any possible passing lanes and it was highly successful in allowing Argentina regain possession and continue with their passing. Two example can be seen below. Above, Tagliafico, Biglia and Lanzini quickly reacts while below, Higuain, Paredes and Di Maria starts pressing straight away. It was extremely enjoyable to watch the way Argentina built attacks as they constantly moved the ball with short passes and few touches to keep the ball away from the Italians. As I said above the starting formation in defence was 4-2-3-1 but in possession this changed into numerous formations depending on where the ball was and also the movement of certain players. When building from the back, the shape became 4-3-3 with Otamendi and Fazio splitting wide and the full-backs moving high down the sides. Biglia then acted as a sole defensive midfielder with Lo Celso to his right and Paredes to his left. When they progressed higher up the pitch though, the fluid movement of the players created many different structures as we’ll see. One key in Argentina’s possession play was their strong usage of the half-spaces. Here, Paredes threads a ball through Italy’s midfield to Lo Celso in the right half-space between the lines of Italy’s defense and midfield. Lanzini has also moved into this space as Argentina use the half-spaces to progress with Verratti in particular often drawn towards the ball rather than covering space. The most interesting aspect of Argentina’s setup was the movement of the left-back Nicolas Tagliafico and West Ham attacker Manuel Lanzini. Lanzini started on the right wing and made movements into the number 10 space to overload the centre of the pitch and create a numerical advantage for Argentina against Italy’s three central midfielders. His inverted movement also vacated the wing space in front of the right-back Bustos who would push right up against De Sciglio and always provide a wide outlet. 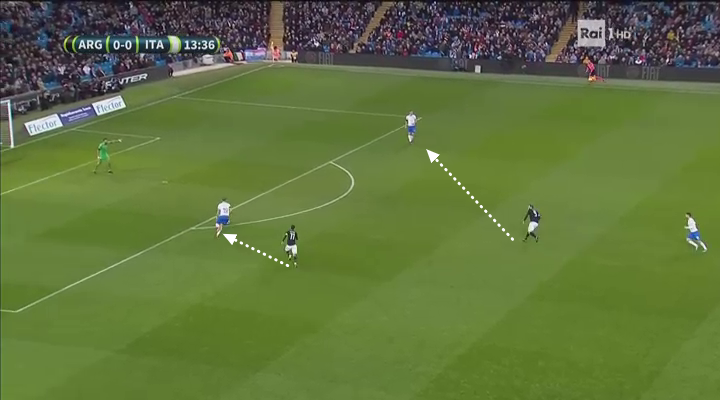 On the left, Tagliafico combined brilliantly with Di Maria with either one of them staying wide and the other moving into the left half-space. What was interesting was the fact it was often Tagliafico who made the movement inside with Di Maria staying wide. Both of these movements, Lanzini’s and Tagliafico’s, are highlighted below. In the image below, Lanzini again moves centrally from the right wing while Tagliafico leaves his left-back spot and moves centrally with the substitute Diego Perotti staying wide on the left and receiving the ball. As you see, their movement gives Argentina five central players behind Higuain, who also made great dropping movements, which is the key behind how Argentina managed to dominate possession, especially in the first 55 minutes. With Lanzini centrally in a number 10 role in possession, he helped create a situational midfield diamond with Biglia at its base, Lo Celso to the right and Paredes to the left. As we all now, this structure creates multiple angles and triangles to move the ball around the pitch. As mentioned it gave Argentina a 4 vs 3 advantage centrally, and coupled with Tagliafico’s inverted movement it became 5 vs 3 for the South Americans. 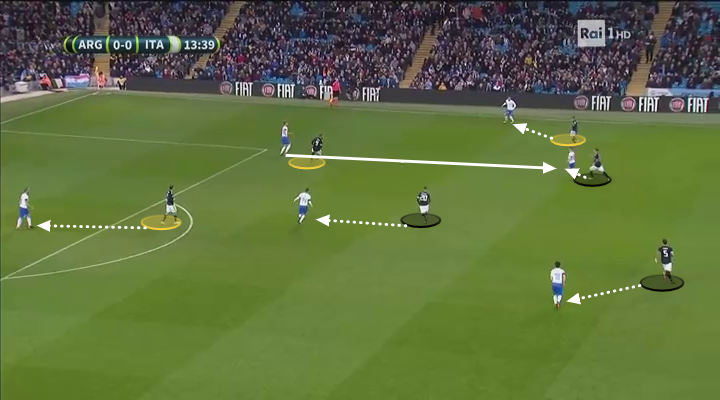 On other occasions, the attacking structure was more straight-forward with the full-backs (red) hugging the touchline, the front three (light blue) more narrow and the midfielders (yellow) providing balance with Lo Celso in a more advanced position. Again note the sheer number of central players and the possible passing combinations this positioning creates. Argentina were flexible, they were fluid and they were enjoyable to watch. Their two goals were scored from counter-attacks which highlighted their ability to damage opponents in different ways. And remember they can still call on attackers like Sergio Aguero, Mauro Icardi and Paulo Dybala if they’d like. Oh, there’s a certain Lionel Messi too. After spending much of the first 55 minutes mostly counter-attacking, and creating one huge chance from one when Insigne blasted wide when through on goal, Italy started to gain control. This coincided with the substitution of Lorenzo Pellegrini coming on in place of Marco Parolo. Pellegrini’s presence meant Italy had three more technically focused midfielders who can dictate play and who were better suited to handle the pressure of Argentina. The main approach of Italy’s attacking play were diagonal passing and lofted passes in behind for Immobile or behind Argentina’s full-backs. The image below provides an example. Jorginho plays a diagonal pass to Verratti who finds plenty of space. He continues the move down the left to Insigne who then sets Immobile on his way with an incisive pass. Although nothing came of this move, it showed Italy’s focus on diagonal passing to force gaps in Argentina’s defensive shape. Ciro Immobile has been fantastic for Lazio this season and is a very good runner in behind a defense but he doesn’t give you a lot in terms of his overall game. His finishing and movement is fantastic and it was good to see how Italy looked to utilize this to create chances. Immobile often moved to his left and would then make runs in behind in the space between the right-back Bustos and Otamendi. Below, Insigne and Verratti combine before Verratti’s lofted pass is controlled by Immobile but Caballero saved his effort. The inclusion of Jorginho gave Italy another superb passer and he always plays with his head up which helped him spot Immobile’s well-timed runs. Here he lofts a pass over Argentina’s high defensive line to the striker. Insigne also used clever movement and the vision of his midfielders to threaten behind Bustos. Here he makes a clever diagonal run in behind which Verratti spots. Insigne then forced a good save from Caballero. Italy eventually lost 2-0 after Ever Banega and Lanzini finished off great counter-attacking moves to give Argentina the win, but Italy had three good chances to take the lead in their best spell of the game from the 55th to the 70th minute. On another day, it could have been a win for the Azzurri but the performance was still encouraging and something for the next coach to build on. International friendlies are rarely exciting or something most fans look forward too, but Argentina and Italy proved that also meaningless friendlies can provide top quality football. For Italy there will be no World Cup, but the youngsters who were given a chance in Manchester did well and gives a cause for optimism. It will be up to the new coach, whenever one is appointed, to maximize the quality in the squad. For Argentina, the coming World Cup looks exciting after they showed Sampaoli’s methods are clearly getting implemented well. Add an Aguero here, a Dybala there or a Messi anywhere and you have a potential world champion.